Back to the ham, I had a Panini today made with Hoosier’s ham. It was fantastic, Mark (our day sous chef) did the sweet and smoky ham up with Robinson Farm’s (Hardwick, MA) Family Swiss and dill pickled onions served on Raul’s (our baker) sandwich bread. I enjoyed with some of our homemade fries and Alex’s (our long-time lunch cook) tangy ketchup. My lunch, fries were added after I took the photo. Making dry cured sausage is simple; grind some meat mix it with spices, stuff it into casings and hang it to dry in a fairly humid, cool space, then wait. To quote Tom Petty “the waiting is the hardest part”. Three-ish weeks later, if all goes well you have a beautiful semi-dried full flavored, rich, fatty, dry, slightly tangy, cured sausage. I have made this recipe many times with varied results, mostly great. However, once in a while I have gotten a batch that just doesn’t work. Don’t worry when it’s not right it’s obvious, it does not have the rosy meat color you expect from air-dried cured meat, it looks kinda gross and smells rotten. Below is a pictorial of the steps we used to turn Hoosier’s fat and flesh into Saucisson Sec (dry-cured sausage). Ground pork mixed with spices. The trusty hand cranked sausage stuffer, many hundreds of pounds of sausage have been made using this beast over the 15 plus years we have had it. I’m pushing out the sausage into casings. Hanging them to dry in our curing room, next to some duck prosciutto that is just about done. Three weeks hanging and they’re done. Though we still have quite a bit of Hoosier left to use; most notably the head and a bunch of meat to braise, it may be a while before we get into it. I will continue to write about as we utilize it. After two plus weeks in brine and 14 hours in the smoker Hoosier’s American Style Smoked Hams are done and they are beautiful; sweet, smoky, moist and tender. We have been making this style of hams for many years, tweaking the recipe and methods to ensure a great ham every time. Hoosier’s hams – each ham is cut into three pieces, brined, tied, smoked, chilled and sliced. Smoking our own hams bring us much more than ham (the meat). The meat could end up in ham sandwiches, part of a pasta dish, paired with cheese for a first course or even as a ham steak. The skin makes a smoky gelatinous stock we often use in pigs skin risotto, soups and stews. Scraps and bits are often used as a flavoring ingredient, such as in our Bangkok Chicken Wings where we pair the sweet ‘n’ smoky ham with Thai fish sauce, lime juice and spicy chilies. We also always place a pan directly under the smoker to collect the drippings (liquid bacon), which finds its way into vinaigrette, sauces and marinades. The fat that surrounds the ham, often 1 1/2″ to 2″ thick is freaking amazing. Currently on our menu are Ham Fat-Potato Croquettes. We take two parts diced ham fat and combine it with one part mashed potato, roll it into balls, bread ’em and then fry ’em. We’re serving them with mustard cream and last summer’s pickles. The next post will be about Saucisson Sec, a dry cured sausage we made from Hoosier. At EVOO all of the land-based protein we use is sourced locally, with the exception of beef, all are from whole animals. We strive to purchase the best proteins with the least amount of environmental impact. This will be the first in a series of posts revealing all of the planning and execution we do for nose-to-tail cooking and menu implementation of a pig. The first thing we need to do is procure the hog. We deal with several farms that raise pigs, some are growing less than 10 hogs a year which are ready when they are ready. 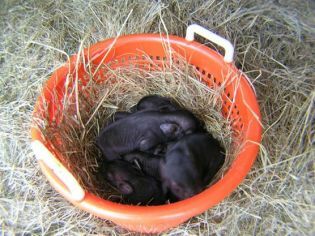 These farmers usually take orders in the early spring, as soon as they get the piglets, for a late fall delivery. I recall a couple of years ago one of our annual pig suppliers Pete Lowy of Pete and Jen’s Backyard Birds in Concord MA held back delivery for a couple weeks because “the pigs are enjoying apples” which had recently fallen from the trees. He figured he would delay the inevitable so not only could the pigs uhm… pig-out, there would also be an added flavor benefit to the pork. Pete and his wife Jen raise a handful of Mangalitsa pigs, a Hungarian breed known for their incredible fat. We are one of the fortunate few to receive one of these beauties each year. Other local farmers we use are producing top quality pastured hogs year round. 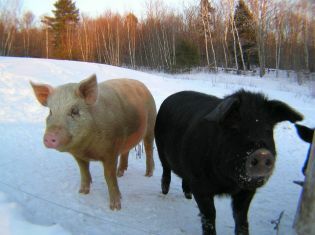 At EVOO we purchase between 4 and 8 pigs a year. As I hope you will see, over the length of these posts, there is a lot that goes into the complete utilization of each hog. With the respect we have for the lives of these pigs and limited space in our kitchen, we need to use every bit of one pig before receiving the next. 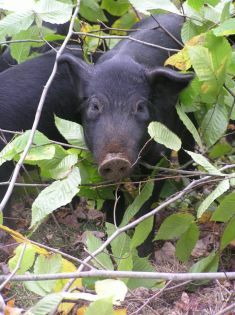 The pig who you will be following through these posts is from our friends at Dogpatch Farm in Washington, ME. His name, provided to us by Sue of Dogpatch is / was Hoosier. 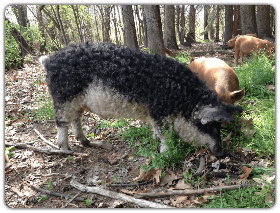 Dogpatch Farm specializes in the Mulefoot hog which is a rare Heritage breed known for its freckled marbling, superb flavor and exceptional hams. My next post will take you through the first few hours after the pig comes through our doors.